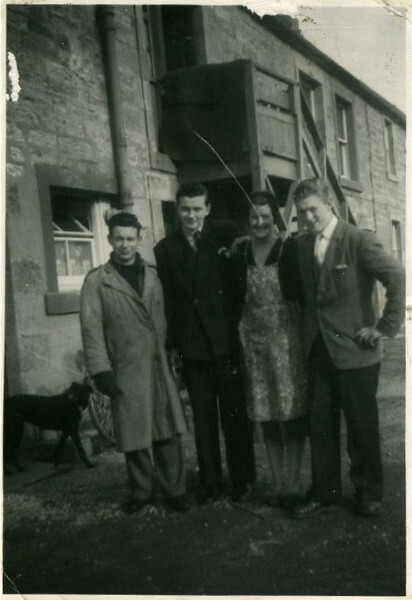 Dan MacDonald writes: A picture from Harbour Buildings, Shore Road, showing me, my mother Rita Macdonald, with mates Douglas Carron (where is he now I wonder?) and Willie (Peam) Munro (wonder where he is now?). Dan, my name is Alistair Hogg - I live in Melbourne Australia. My grandmother is Isabella Hogg nee Macdonald, your mother's sister. Do you have anymore photos of your side of the family? I would be very interested in seeing them if possible and learning more about my Scottish heritage. Hope to hear from you soon. Hello, Alistair. My memory isn't what it used to be (I'm 75), but I do remember attending with my classmates at the Invergordon train station at 9:00 o'clock in the morning in the early '50s to see one of our classmates and her family leave bound for Australia. I'm not sure of her first name (it might have been Rena? ), but the family name was Hogg. Thanks Margaret for your memories. Just thought I would let you know that my dad (William - Bill) left for Australia in 1949. His sister's name was Renee so your memories are spot on - thank you so much. Did you know any of their relatives? Sorry, Alistair, I didn't know any of Renee's relatives. I left Invergordon in 1939 (as a baby) for Glasgow, where I started school in 1945, returned to Invergordon in 1947 following my father's death, and started school in the old Primary School. So, in 1949 I would have been in Miss Corbett's class (she was known to her students as Miss "Cobweb"). My brother, Harry, just emailed me to see picture #1640, which you posted and which I somehow missed!